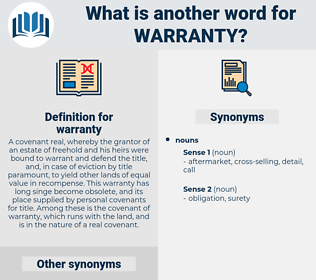 What is another word for warranty? A covenant real, whereby the grantor of an estate of freehold and his heirs were bound to warrant and defend the title, and, in case of eviction by title paramount, to yield other lands of equal value in recompense. 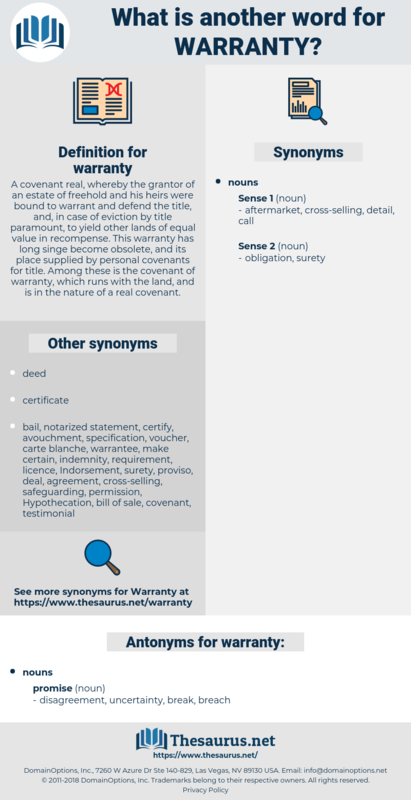 This warranty has long singe become obsolete, and its place supplied by personal covenants for title. Among these is the covenant of warranty, which runs with the land, and is in the nature of a real covenant. reassurance, guaranty, certainty, escrow, maintenance, Guaranteeing, collateral, security, undertaking, Underwriting. ensures, promises, secures, sets, Guarantees.